In spite of general decline worldwide, off-pump coronary artery bypass grafting (CABG) surgery is performed in more than 60% of patients undergoing CABG in India; mainly because of shorter operative time and reduced procedure cost. However, paucity of data exists in literature about early outcomes following off-pump CABG from India. We conducted a prospective observational study of 800 consecutive cases that underwent off-pump CABG (OPCAB) from August 2015 to October 2017. Primary end point of the study was the 30-day/in-hospital mortality from any cause. On multivariate analysis, emergency surgery (OR 9.72; CI 1.96–48.21, p value 0.005), severe left ventricular dysfunction (OR 2.28; CI 1.25–4.76, p value 0.026), postoperative atrial fibrillation (OR 9.95; CI 3.12–32.01, p value 0.05), and dialysis-dependent renal failure (OR 29.7, CI 10.02–87.99, p value 0.006) were the factors associated with mortality. The observed mortality was 1.6%, and the expected mortality by EuroSCORE II was 2.6%. The median EuroSCORE II of expired patients was 3.03 and of entire cohort was 1.54 (p value 0.001). Stroke rate was 0.9%. Deep sternal wound infection occurred in 0.9%, and 3.8% patients were readmitted to the hospital after discharge. Early outcome of off-pump CABG was excellent in this study. Increased incidence of deep sternal wound infection remains a concern. Multicenter study with a larger sample size is required for a dependable evaluation of the efficacy of off-pump CABG in Indian population. 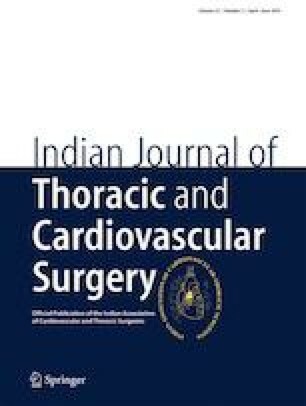 The authors have carried out a very relevant prospective observational study assessing early outcomes of off pump coronary artery bypass [OPCAB] as a strategy for coronary revascularization in the Indian population. The study is especially important because post-CABG outcome data in Indian population is relatively sparse in the literature. However, few aspects of the study mostly related to design and statistical tests perhaps need further discussion. Q1. With regard to the sample size, by their own admission, the authors have reported data only on 800 (66.6%) patients of the 1200 required by the sample size calculation. A drop in sample size of this magnitude is quite significant and can the authors therefore reliably dismiss the presence of a type Ii error in their findings? We were only able to operate on and include 800 cases during the time period of our study hence the study is stated to be underpowered and unfortunately we cannot reliably dismiss these errors. Q2. It is well known that emergency conversions during OPCAB tend to be associated with higher adverse outcomes. Why did the authors therefore choose to include this group in the study population which brings lot of heterogeneity in the data? To identify how these patients influenced outcomes can the authors provide mortality data on the patients who underwent emergency conversion? We have included emergency on-pump conversions as these patients had been initially included in the study preoperatively and planned for off-pump CABG. Since emergency conversion is associated with increased morbidity and mortality, we believe that this is an important variable to include in any analysis of off-pump procedures. Otherwise, it will reflect on the outcome of on-pump cases and unduly favors off-pump procedure if any comparative studies were to be undertaken. Among the patients who underwent emergency conversions, 1 case (1/9, 11.1%) expired as compared to 8 cases that survived. Q3. The authors have carried out a case-control study by creating two groups based on mortality. However, the two groups created are grossly unequal in numbers (787 vs. 13). Unequal sample sizes affect statistical power and type I error rates. Moreover, the chances of confounding also increase. Do the authors feel that findings of their comparison in Tables 3 and 4 are reliable or should the two groups have been created using propensity matching? Seeing the number of cases of the two groups that are being compared it is improbable to subject these groups to propensity matching due to the stark difference in the number of cases in each group. Our statisticians have not been able to conduct propensity matching in these groups of patients; hence, difference in statistical power, type 1 error rates, and chance of confounding are present. Q4. The incidence of HbA1c levels > 8.0 was seen in 30 (4%) in survivors and 3 (23%) in non-survivors. Quite strangely, the difference does not appear to be statistically significant. More importantly, the mortality in patients with HbA1c levels > 8.0 was nearly 9% (3 out of 33). This is an interesting finding because the mortality in this group is more than five times the mortality seen in the entire study population and in keeping with other studies which have shown that mortality quadruples at HbA1c > 8.0. Did the authors include this variable in the multivariate model? This variable has been included in the multivariate model and found to be statistically insignificant. This insignificance is probably a reflection of the different socioeconomic profile and patient population. Q5. Cerebrovascular disease has been reported in 30 (4%) of survivors and 3 (23%) of non-survivors. Do the authors mean that these patients had previous neurological event? As patients with previous neurological event are more prone to developing adverse postoperative neurological outcomes are the authors able to comment on how many of the strokes (n = 7) seen in their study population occurred in patients with history of cerebrovascular disease. Cerebrovascular disease which was reported in this study includes those patients who on Doppler analysis showed an asymptomatic non-flow limiting < 69% stenosis in unilateral internal carotid artery. None of the patients had preoperative history of any neurological event. Symptomatic carotid stenosis patients or those patients having flow limiting lesions requiring concurrent carotid endarterectomy were not included in the study. Postoperative stroke occurred only in seven cases (0.87%) in the survival group and three of them had documented cerebrovascular disease. Q6. The study population has an extremely high number of patients with recent MI (61%). Data from the Danish, Tokyo, COAPT, SNAPSHOT, and many other registries worldwide have consistently shown CABG rates to be around 10% in patients with acute coronary syndrome. Can the authors clarify whether this difference is related to the definition of recent MI used in their study or is it a reflection of a patient population with different socioeconomic profile and a different healthcare delivery strategy in India? Recent myocardial infarction was defined as MI occurring within 30 days prior to surgical intervention. It does not mean that we had performed emergency or urgent surgery for acute coronary syndrome. Patients with documented recent myocardial infarction were seen in 61% of patients; this figure is higher than most series in CABG. This difference is probably a reflection of the different socioeconomic profile, patient population, and healthcare delivery as you rightly pointed out. Despite some of the questions raised, the authors have to be congratulated for achieving excellent early results following OPCAB with a very low conversion rate. The report will certainly reiterate the belief that OPCAB in the Indian population is an effective strategy for coronary artery revascularization. 1. Halkos ME, Puskas JD, Lattouf OM, et al. Elevated preoperative hemoglobin A1c level is predictive of adverse events after coronary artery bypass surgery. J Thorac Cardiovasc Surg. 2008;136:631–40. 2. Narayan P, Sarkar K. Surgery in acute coronary syndrome: technical considerations and clinical outcomes. In: Chandra KS and Bansal M (eds) Cardiology update 2017: RELX India, 2017, pp. 193-199.